Stokes Stars in Tigers’ Eight Goal Victory. Hexagon Telford Tigers 1 faced off against Billingham Stars in an NIHL Moralee Division game on Saturday night at Telford Ice Rink. The game was Tigers’ first league game in three weeks and only their third league game in the last ten matches after spending most of the recent schedule playing cup games. Tigers’ lack of league games had seen them slip to fifth in the table, seven points behind leaders Sheffield Steeldogs, albeit with three games in hand. Tigers were able to restore Dan Mitchell to the line up after fears of a lengthy ban were allayed when the league overturned the decision to suspend Mitchell for an alleged punch in an U18 game the previous weekend. Tigers added Ryan Lewis to the team as cover for the injured Denis Bell. Tigers were still without Warren Tait but added Jed Moreland to the roster. Tigers started the game well and had a great chance early on after Jonathan Weaver sent Jason Silverthorn clear but his shot went over the top of the goal. Tigers scored with their next opportunity in the 7th minute. Weaver found Andy McKinney who made a drop pass at the blue line for Scott McKenzie to skate onto. McKenzie blasted the puck over Billingham net minder James Flavell’s shoulder into the top corner of the net to give Tigers the lead. Tigers continued to dominate with Doug Clarkson and Adam Taylor both going close but unable to convert. Weaver was then called for slashing, giving Billingham the first power play of the game. The Stars took full advantage of the extra man with a neat passing move that left the unmarked Michael Elder with a tap in at the far post to level the game. As the period wore on, Tigers continued to have chances but could not finish them. Flavell made two good saves from Clarkson at close range and a sprawling leg pad save from Taylor to keep the game level at the end of the period. Tigers took the lead within forty seconds of the restart, Ricky Plant and Silverthorn combined to pass the puck to McKinney in front of goal; McKinney held onto the puck and timed his shot to perfection sliding it low past Flavell for Tigers’ second goal. Tigers held the lead for only 3 minutes as some sloppy play allowed a goalmouth scramble with Billingham’s Chris Sykes reacting first to smash the puck into the net to level the game. Tigers continued to present chances to Billingham as Sykes and Ethan Hehir missed from close range. Tigers then took the lead for the third time in the 30th minute, McKinney did well to win a board battle in front of the Tigers’ bench and pass the puck to Brodie Jesson who was standing just inside the Billingham defensive zone. Jesson’s quick low shot caught out Flavell to give Tigers a 3-2 lead. Billingham had another chance shortly after but Sykes was robbed by a terrific glove by Tom Hovell in the Tigers’ goal. Billingham were immediately made to rue their missed chances when Mitchell found the unmarked Jesson in front of goal, Jesson picked out the corner of the net with a neat wrist shot for Tigers’ fourth goal. Tigers were then presented with one final chance as the period ended with a power play after Billingham’s Jack Davies was called for hooking and lucky not to concede a penalty shot with referee Tim Pickett deeming the offence only worth a two minute penalty. Less than a minute into the man advantage, McKinney found the unmarked Clarkson with a cross ice pass, Clarkson hammered the puck past the helpless Flavell for the 5th goal of the game giving Tigers a 5-2 lead going into the final period. Early in the 3rd period, Jesson was awarded a five minute fighting penalty and ejected from the game. Billingham’s Matthew Campbell was lucky to avoid a third man in penalty which would have seen him ejected, but instead was called for slashing. The penalties meant that both teams would have four men for two minutes followed by Billingham having a three minute power play. Tigers would score the sixth goal, whilst four on four. Silverthorn showed great skill to keep hold of the puck, skate in on goal and shoot past Flavell. As the game entered the final ten minutes, Plant shot from a tight angle and saw his shot saved, but he was first to react to the rebound and chipped the puck over Flavell, who was still prone on the ice after the first save, into the net for the seventh goal. At this point Billingham changed net minder with Mark Watson replacing Flavell. Unfortunately for Watson, the first action he had was to pick the puck out of the net after Jordan Stokes hammered a powerful slap shot past him for Tigers’ eighth goal to round off the scoring. Tigers’ win takes them up the table to third place, five points off leaders Sheffield. 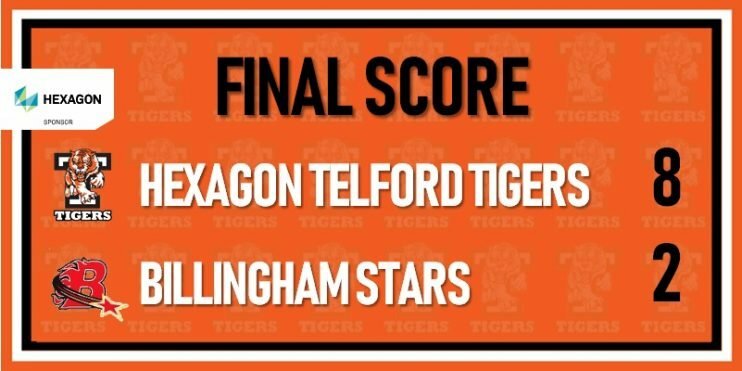 Final Score: Hexagon Telford Tigers 8 Billingham Stars 2. Scorers: Scott McKenzie, Andy McKinney, Brodie Jesson (2), Doug Clarkson, Jason Silverthorn, Ricky Plant and Jordan Stokes. Man of the match: Jordan Stokes. Hexagon Telford Tigers 1 return to play at Telford Ice Rink Saturday 8th December at 19:00 in the NIHL Moralee Conference against Blackburn Hawks. Hexagon Telford Tigers 2 are next in home action at Telford Ice Rink on Sunday 9th December at 18:00 in the NIHL Laidler Conference against Sheffield Senators.